A second device working with filters and light intensity quantification has been built. It now no more works with a photoresistance because it wasn’t enough sensitive. So we tried to replace it with the light to frequency meter TSL235 already used for the turbidity quantification. Almost the same code was used for quantify the fuoresent light. 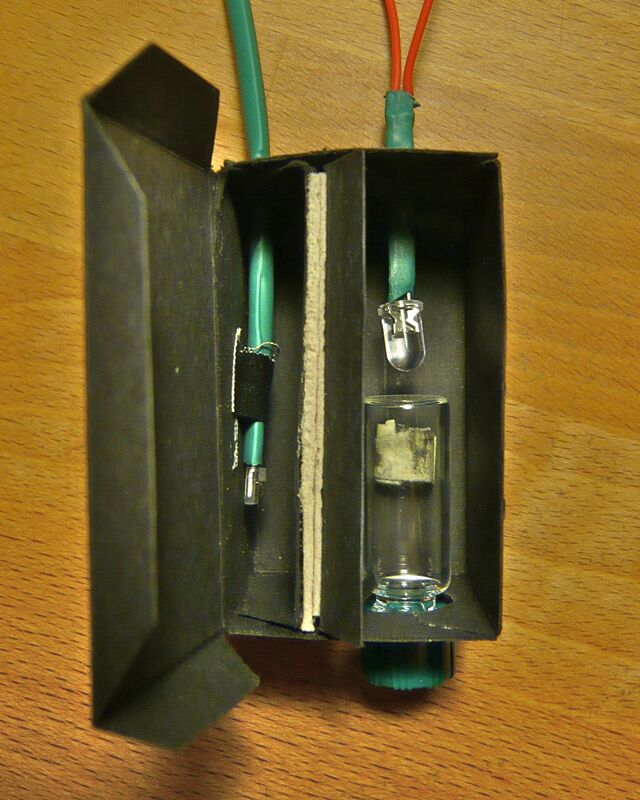 the device works with the same filters as the first one, but this time the components were all inculded in a little dark box to assure the darkness. but for the first tests we haven’t closed it to have access to all the components. The lens was abandoned because it requires very precise dimensions and we can’t really assured it with cardboard and moving components. So the light sensor was put directly behind the filter to be as close as possible to the sampleholder. We tested the device with different concentration of the fluorescent molecule dextran. The concentration was always diluted by two and the device always displayed a value which was the half of the previous value. So with the dextran’s high fluorescence, we get the first results which confirm that this kind of device could work. Unfortunately, as we went to Dr. Van der Meer’s lab, the tests with the real bacteria grown in different arsenic concentrations, the device was completely unable to distinguish the different samples while the samples have been easily differentiated by the fluorometers of the laboratory. Whether the light emitted by the bacteria samples wasn’t enough intense to be detected by the light to frequency meter, or its position was too far from the place where the sample was excited by the led meaning that the eGFP protein in front of the light sensor weren’t excited and thus haven’t emitted enough light to be detected by it. After disscussion, a third prototype with a better design is already in preparation.